به‌منظور بررسی اثر روش مصرف ریزجانداران مؤثر بر ویژگی‌های رشدی زعفران در حضور کودهای شیمیایی و آلی، آزمایشی در سال زراعی 93-1392 در شهرستان ششتمد خراسان رضوی انجام شد. آزمایش به‌صورت کرت‌های خردشده در قالب طرح پایه بلوک‌های کامل تصادفی با سه تکرار اجرا گردید. فاکتور اصلی آزمایش شامل روش مصرف ریزجانداران مؤثر (EM) در سه سطح عدم مصرف، مصرف خاکی EM و محلول‌پاشی EM و فاکتور فرعی شامل مصرف کودهای آلی و شیمیایی در چهار سطح عدم مصرف، مصرف خاکی اسید هیومیک، مصرف خاکی کود 20, 20, 20+TE و مصرف خاکی اسید هیومیک + مصرف خاکی 20, 20, 20+TE بودند. نتایج نشان داد که مصرف خاکی و محلول‌پاشی EM ارتفاع بوته را تحت تأثیر قرار نداد، اما باعث افزایش معنی‌دار تعداد بنه، عملکرد بنه، وزن خشک اندام هوایی و تعداد جوانه در هر بنه در مقایسه با شرایط عدم مصرف EM گردید. متوسط وزن بنه در واکنش به مصرف خاکی و محلول‌پاشی EM کاهش یافت. بیشترین تعداد بنه (33/220 در مترمربع)، عملکرد بنه (33/1023 گرم در مترمربع) و وزن خشک اندام هوایی (02/43 گرم در مترمربع) در تیمار مصرف خاکی EM، بیشترین تعداد جوانه در بنه (68/8) در تیمار محلول‌پاشی EM و بیشترین متوسط وزن بنه (10/5 گرم) در شرایط عدم مصرف EM به دست آمد. استفاده از کود 20, 20, 20+TE و همچنین مصرف تلفیقی اسید هیومیک و کود 20, 20, 20+TE باعث افزایش تعداد بنه، عملکرد بنه، وزن خشک اندام‌ هوایی و تعداد جوانه در بنه در مقایسه با شرایط عدم مصرف کود و همچنین مصرف خاکی اسید هیومیک گردید. بیشترین متوسط وزن بنه در تیمار مصرف خاکی اسید هیومیک به‌دست آمد. مصرف خاکی و محلول‌پاشی EM باعث بهبود واکنش ویژگی‌های رشدی زعفران به مصرف کودهای آلی و شیمیایی گردید. با توجه به نتایج، مصرف خاکی EM و کود 20, 20, 20+TE جهت تولید حداکثر عملکرد بنه در زعفران قابل توصیه می‌باشد. In order to investigate the effect of effective microorganism application method on saffron growth characteristics in the presence of chemical and organic fertilizers, a field experiment was conducted at Sheshtamad County during the growing season of 2013-2014. The experiment was carried out as split plot based on a randomized complete block design with three replications. The experimental factors included effective microorganisms (EM) application method as main plots (no application, soil application and foliar application of EM) and chemical and organic fertilizers application as subplots (no application, soil application of humic acid, soil application of 20, 20, 20+TE and soil application of humic acid + 20, 20, 20+TE). The results showed that soil and foliar application of EM had no significant effect on plant height, but it significantly increased corm number, corm yield, shoot dry weight and number of buds per corm. The average corm weight was reduced in response to soil and foliar application of EM. The highest corm number (220.33), corm yield (1023.33 g m-2) and shoot dry weight (43.02 g m-2) were obtained in soil application of EM treatment. The maximum number of buds per corm (8.68) and average corm weight (5.10 g) were observed in foliar application and no application of EM conditions, respectively. Application of 20, 20, 20+TE and combined application of humic acid and 20, 20, 20+TE increased corm number, corm yield, shoot dry weight and number of bud per corm compared to control and soil application of humic acid. Soil application of humic acid produced the highest average corm weight. Soil and foliar application of EM improved the response of saffron growth characteristics to organic and chemical fertilizers. According to the results, soil applications of EM and 20, 20, 20+TE are recommended to produce maximum corm yield in saffron. Behzad, S., Razavi, M., and Mahajeri, M. 1992. The effect of various amounts of ammonium phosphate and urea on saffron production. International Symposium on Medicinal and Aromatic Plants, Acta Horticulture 306: 337-339. Cakmak, R., Kantar, F., and Algur, F. 1999. Sugar beet and barley yield in relation to Bacillus polymyxa and Bacillus megaterium var. phosphaticum inoculation. Journal of Plant Nutrition and Soil Science 162: 437-442. Higa, T., and Parr, J.F. 1994. Beneficial and effective Microorganisms for a Sustainable Agriculture and Environment. International Nature Farming Research Centre, Atami, Japan. pp, 160. Higa, T. 2000. What is EM technology? EM World Journal 1: 1-6. Jahanban, L., and Lotfifar, A. 2012. Study of the ffective Organism (EM) application effect on efficacy of chemical and organic fertilizers in corn cultivation (Zea mays S.C704). Plant products technology 11 (2): 43-52. Jasmi, K.H., Karduny, F., and Behdani, M. 2009. Evaluation of the use of fertilizers and its impact on the performance of farms. Congress's challenges fertilizer, fertilizer half a century. Tehran Olympic Hotel. 10-12 March. Khaliq, A., Abbasi, M.K., and Hussain, T. 2006. Effect of integrated use of organic and inorganic nutrient sources with effective microorganisms (EM) on seed cotton yield in Pakistan. Bioresource Technology 97: 967-972. Munshi, A.M. 1994. Effect of N and K on the floral yield and corm production in saffron under rainfed condition. Indian Arecanut Spices Journal 18: 24-44. Naghdibadi, H., Omidi, H., Golzad, A., Torabi, H., and Fotookian, M.H. 2011. 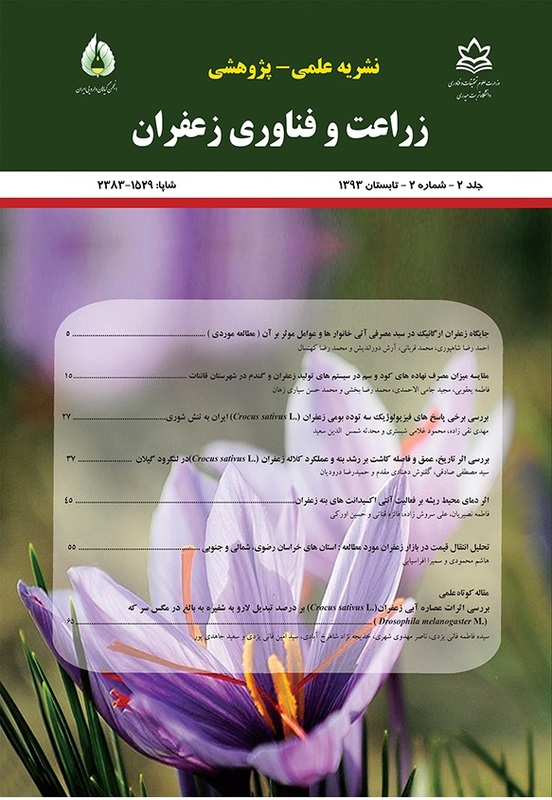 Change in Crocin, Safranal and Picrocrocin content and agronomical characters of saffron (Crocus sativus L.) under biological and chemical of phosphorous fertilizers. Journal of Medicinal Plants 4 (40): 58-68. Nehvi, F.A., Lone, A.A., Khan, M.A., and Maqhdoomi, M.I. 2009. Comparative study on effect of nutrient management on growth and yield of saffron under temperate conditions of Kashmir. III International Symposium on Saffron: Forthcoming Challenges in Cultivation, Research and Economics. Acta Horticulture pp, 850. Omidi, H., Naghdibadi, H.A., Golzad, A., Torabi, H., and Fotoukian, M.H. 2009. The Effect of chemical and bio-fertilizer source of nitrogen on qualitative and quantitative yield of saffron (Crocus sativus L.). Journal of Medicinal Plant 8: 98-109. Ranjith, N.K., Sasikala, C., and Ramana, C.V. 2007. Catabolism of l-phenylalanine and l-tyrosine by Rhodobacter sphaeroides OU5 occurs through 3,4-dihydroxyphenylalanine. Research Microbiology 158: 506-511. Rasooli, Z., Maleki Farahani, S., and Besharati, H. 2013. The response of some growth characteristics of saffron to different fertilizer sources. Soil research 27 (1): 35-46.